This is one of several sets that Top Notch offers and it is for the Spitfire IXc. Specifically it is for the plane flown by Johnny Johnson. 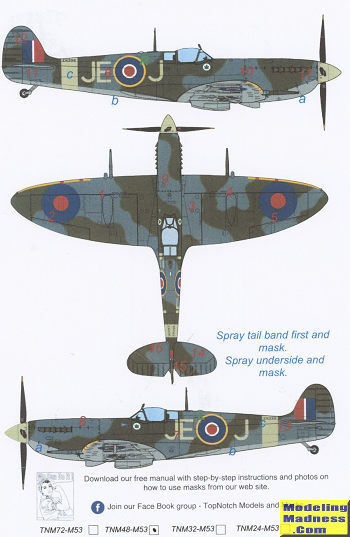 The set does not include any of the insignia or codes and it seems to me that you can pretty well use it for any Spitfire with this style of camouflage. The British were pretty standardized by the time the IX came around. This set is in 1/48 scale, but they are also available in the other major scales. 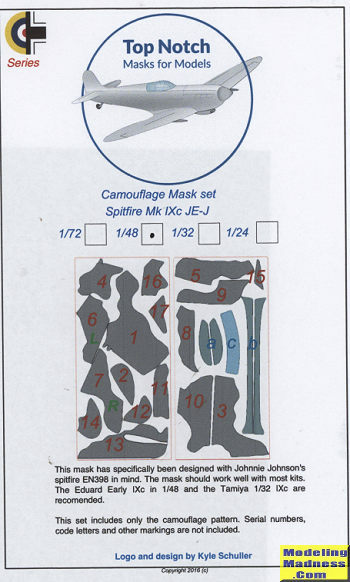 The set does come with a mask for the fuselage band as well so you paint that then apply the mask. As with the other set reviewed, you paint the lighter color, apply the masks and then do the darker. There are helpful notes included. The set comes with full instructions and if you have never used these before, you can get full instructions via a link on their web site.